What is the main difference between this Firstlook sensor and a Pressure Transducer? The Senx FirstLook sensor (FLS) is a device, using a piezeo sensor, that measure pressure change rather than gauge or absolute pressure (compared to most strain gauges). The FLS is, however, extremely sensitive. So sensitive, in fact, that it can pick up the pulses a fuel pressure regulator (unplugged from its vacuum line) creates from the opening and closing of the fuel injector pintles. Most other sensors cannot do this. The FLS suffers in that the amplitudes of the voltage outputs are difficult to scale to a specific pressure. A 10 volt spike does not necessarily mean a 10 psi spike. This is where a Pressure Transducer shines. Long story short, best case scenario is to own one of each. 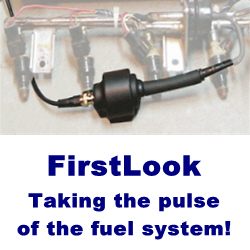 An FLS is great in the intake, exhaust and on the fuel pressure regulator but in some cases you may need a high quality Pressure transducer to qualify what the FLS is reporting (namely in the intake) as well as for use in cylinder and many other applications where a gauge would normally be used (transmission, engine oil, fuel pressure, etc).